Log On to Your Individual Ministry Schedule If you experience problems logging on to MSP, contact Resurrection’s MSP Administrator, Deni Lewis, at rlcnndeni@gmail.com and she will send you your log on information. 1. 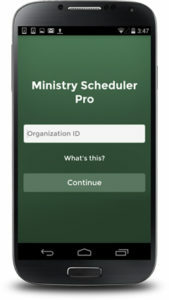 Go to the App Store or Play Store on your device or search for “Ministry Scheduler Pro,” and install the app.